OrissaProperty.com is one of the best real estate website to provide the latest news about housing projects like housing lands, simplex, duplex, apartments, flats, plots, commmercial complexes, farm houses, and shopping malls. This is located at 129, Bapuji Nagar, Bhubaneswar, Odisha, 751009, India. 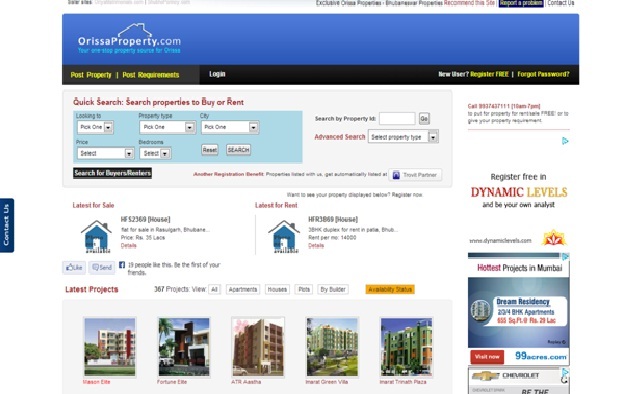 This website includes 400 + projects and you can also search properties to buy or rent or sale. The sister sites of OrissaProperty.com are OriyaMatrimonials.com and ShubhoPorinoy.com.